Celebrating 10th years Anniversary with KPC Business Centre, get a gift TODAY! Thank you for continued support over the years. Your trust is much appreciated and is the motivation for us to do better in the future. Throughout the past 10 years, KPC has been assisting many local and foreign entrepreneurs and start-ups to grow their business successfully. We have successfully expanded our services scope in various area to cater for your growing business needs.Our focus on high quality of customer services has been well recognized by our clients as well as our business partners. In the future, we are committed to continue our client-oriented approach by providing you with the best services. 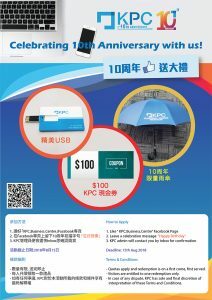 Next story KPC Business Centre – Company Formation 2019 New Year promotion – Save $500 now!